Fun for the whole family! Introduce your children to outdoor activities to give them a memorable experience. Minimum of 6 people required. Why not combine with another family or Grandparents? Group activities for all ages from 5 years and upwards – birthday parties and organised groups for camping and expeditions. Since March 2013, East Grinstead has become the northern terminus of the prestigious Bluebell Railway, the UK’s premier restored railway. There is a full programme of events through the year and frequent departures from the Bluebell’s East Grinstead platform. 240 acres of beautiful countryside, dedicated to many great outdoor activities: birthday parties, family days out, company days and teambuilding, or activity days for groups of friends. The 150-acre estate produces Kingscote wines, and offers vineyard tours, a wine shop, fishing and Tithe Barn for weddings, cookery classes and hire. Located near the Kingscote Bluebell Railway station, it is set amongst picturesque lakes and rolling hills. Laser tag is a thrilling fast-paced adrenalin pumping team based warfare game suitable. Teams battle it out to be the victors on the day using state of the art 100% safe ‘laser’ rifles that fire a beam of Infra Red light and activate a sensor on the enemy’s head. Weir Wood is located on the edge of the Ashdown Forest at Forest Row just over 3 miles form East Grinstead. Weir Wood Reservoir is about 1.5 miles long and extends to about 280 acres. Children’s Off Road Driving, Quad Biking, Off Road Go Karts, Archery And Much Much More! Unlike other companies, we specialise in events for children and families. All the yurts and rooms and campsites and studios and fields and spaces at YoghurtRooms are yours to conjure with. Whatever you want to do, however you want to do it, we can provide the perfect space to make your event or holiday or recording session or special occasion absolutely unforgettable. Cat Inn is a 16th century free house, with four bedrooms, set in the picturesque village of West Hoathly, a hilltop village set in the heart of the Sussex countryside. It is in within easy distance from the towns of East Grinstead and Haywards Heath. Saint Hill Manor, located on the outskirts of East Grinstead, is reputed to be the finest 18th century sandstone building in Sussex. It is also one of the few historical attractions that is open to the public all year round, even during the autumn and winter months. Designed by Philip Webb, the house is one of the finest examples of Arts and Crafts workmanship, with Morris & Co. interiors creating a warm and welcoming atmosphere. The house is dressed for a weekend stay in 1925, so you can imagine you are a guest of the family. The only one of its kind open to the public, this beautiful 15th century Wealden hall house stands in a traditional cottage garden on the edge of the Ashdown Forest in picturesque West Hoathly. Set within 120 acres of glorious Sussex countryside, Alexander House is a luxury manor house with beautiful vistas, a choice of restaurants, an award-winning Utopia Spa and rooms designed for absolute comfort. Our 5 star hotel is located on the borders of Sussex and Surrey, yet convenient to Gatwick Airport and only 55 minutes from London. The 17 bedrooms and suites at Gravetye Manor in East Grinstead are named after tree species found on the estate. Rich fabrics, fine antiques and hand crafted beds emphasise the classical beauty of the interiors, whilst floral themes bring the garden into the manor. All our rooms are individually furnished, providing the highest standards of comfort. Visit our Tourist Information Desk in the East Grinstead Library, call 01342 410121. The tourism desk is manned 9am – 5pm Monday to Friday. When tourism staff are away from their desk a basic relief cover is kindly provided by staff of the West Sussex County Council Library service. 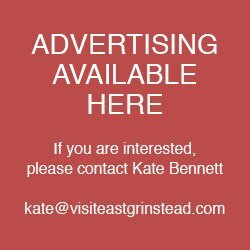 Connecting & supporting local business with local people – the East Grinstead Business Association is the voice of local business. Ashdown Forest is an exciting tourism destination, conveniently located between London and the South Coast. It’s a great choice for a day out, a relaxing weekend or a longer holiday!